Could Colts Utilize Salary Cap Space for Beneficial Trade Possibilities? Share Could Colts Utilize Salary Cap Space for Beneficial Trade Possibilities? While the NFL does not have a specific system for how a team can trade players or draft picks for cash considerations, the Houston Texans proved last year that teams are willing to pay with draft picks to unload a player with an unwieldy cap hit. Typically, the most interested parties for trades such as this will be teams who have plenty of cap space and who are placing an emphasis on drafting players to form the foundation for the future. This year, the Colts are sitting with what is currently projected as the fourth overall cap space in the NFL a month away from free agency. While we know that Chris Ballard has been deliberate with the use of salary cap space and has not gone out of his way to take on massive contracts, we also know that he is interested in acquiring draft picks if there are meaningful ways to do so. While there is likely not a non-quarterback on another team who would allow the Colts to upgrade at a position and then also add a draft pick in 2018 free agency, there are some interesting potential trade opportunities and considerations the team should at least consider as other NFL franchises look to clean up their own books. 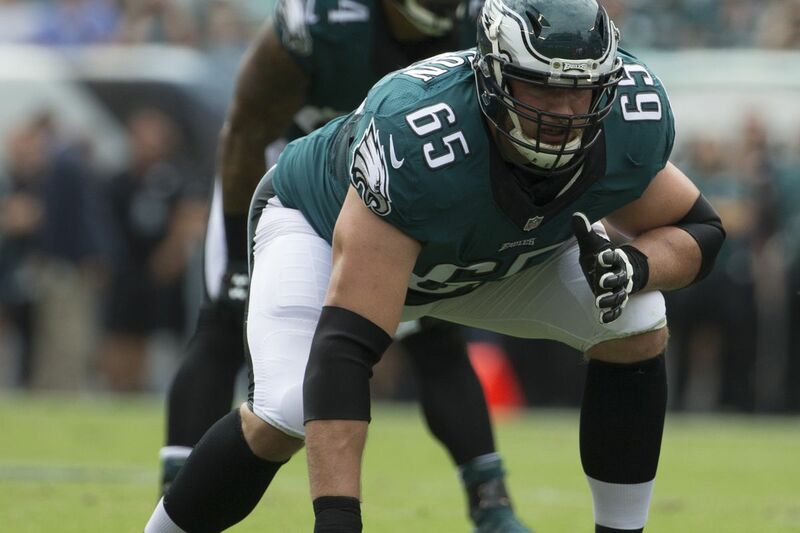 The top team who will be a target for cuts and potential trades is the Philadelphia Eagles. The team is currently projected to have the lowest available cap space in 2018 by $10 million dollars and are currently negative nearly $5 million in projected cap. It is a good thing that Philly just own the Super Bowl because there may be some interesting choices ahead. It is important to recognize that the Eagles already have some free agents who could require their attention if they plan to keep their championship winning core together. Consider that cornerback Patrick Robinson had the best year of his professional career and is an unrestricted free agent, tight end Trey Burton is also a valuable player across from Zach Ertz and he is entering free agency. LaGarrette Blount was also an important part of their backfield rotation. Players the Eagles could consider as potential trade pieces include tackle Lane Johnson (28) and linebacker Mychal Kendricks (27). The issue with Johnson is that he is slated to cost the team over $12 million in cap space and he is expected to return to the right tackle position when marquee left tackle Jason Peters returns to the field next season. They are in desperate need of cap space and as much as they don’t want to breakup one of the best offensive lines in the NFL from last year, paying Johnson the second highest salary on the entire roster (more than Peters) seems difficult to sustain. The situation with Kendricks is that he fell a bit out of favor when Philadelphia made some defensive changes a couple of years ago. His best position, arguably, is at the Mike linebacker position in a 4-3 base scheme. He has the athleticism to cover over the middle of the field and can make a real impact when healthy. He finished the season as a starter for the Eagles and they could look to bring him back in that role but injuries helped secure his spot in the rotation so it wouldn’t be a total shock that he could be a cap casualty. Another team who is facing a bit of a cap crunch and who might be looking to take advantage of some resources they have on the team is the Green Bay Packers. Aaron Rodgers will be returning to the field after an injury held him out of the majority of 2017. He has the benefit of a stellar group of receivers now led by Davante Adams. With Adams potentially the top target moving forward, what does the team do with Jordy Nelson and Randall Cobb who are both paid over $12 million against the cap next year? Do they plan on carrying over $30 million in cap hit at the receiver position alone? The reality is that they can clear 9 or 10 million dollars in cap space by cutting either of their veteran receivers. They may entertain offers for Cobb or Nelson in a trade for a team who has the cap space to take on the contract and is looking to bolster their receiving group. Next on the list is the Dallas Cowboys. They’re best pass rusher is set to become an unrestricted free agent in March. It is highly unlikely that they will allow him to escape and more likely that they would use the franchise tag on him to stop that from happening than anything else. However, the franchise tag will be expensive and they are currently only projected at $20 million in space for the 2018 season. Could they look to unload an unwieldy contract for a player who hasn’t been able to consistently perform or stay on the field for the last couple of seasons? Wide receiver Dez Bryant carries a cap hit of $16.5 million in 2018. A team with a lot of cap room could convince Jerry Jones that it is best to let the big receiver go in order to keep the nucleus of his team intact and manage the cap for the future. There are two other teams who may be facing an interesting situation financially as they look to the future. The New Orleans Saints have $32 million in projected cap space to work with but Drew Brees is an unrestricted free agent. If the team retains him, as expected, it will cut deeply into that number. They have other key free agents who they would like to re-sign but will be hard pressed to do so without creating some space somewhere. Would the Saints consider trading Mark Ingram to a team who could take on his $6.2 million cap hit to get some breathing room. After Alvin Kamara burst onto the NFL scene as one of the biggest weapons in the league, it might be overkill to have another running back taking up considerable cap for the position. There are teams who need a running back for the future and could certainly afford to take on Ingram’s contract to fill that role. Finally, the Denver Broncos are facing a bit of a dilemma. They are in a reasonable position with $25 million in cap space but they have to figure out the quarterback position. Do they make a play for a big name in free agency and take on a big contract that will take a big bite out of their 2018 budget? They have some nice pieces at certain positions but there is a lot of space sunk into the receiver position and a real possibility that they need to focus on adding youth and becoming more economically flexible. Demaryius Thomas and Emmanuel Sanders are generating some discussions as potential cap casualties but they carry $4 million and $5 million in dead cap for 2018 alone if they were cut. The Broncos might want to create some room but their best best is to find a team with the cap space to take on a $10-12 million contract and the need for a receiver. While it currently appears unlikely that the Colts are in a position like the Cleveland Browns were in 2017 with Brock Osweiler, there are certainly teams who have assets that could interest Frank Reich and Chris Ballard as they go to work trying to form a team who can return Indianapolis to the playoffs. The team could use a legitimate wide receiver, an upgrade at linebacker, a potential starter at running back who is used to working in a timeshare, and offensive line upgrades. There might be opportunities where an entirely reasonable trade could be made to help create cap space for a team who needs it and help fill an important hole in Indianapolis. Could the Colts draft a tight end in the first round? The most common outcome predicted for the Colts #26 pick is either a defensive lineman or a receiver, but there is a different route.